﻿ Payment Gateways Part III: PayPal You can use PayPal to process credit card payments directly from your Front Desk manager. PayPal is a free addition, to Hotel Management Software in the Cloud. Sell more rooms, improve revenue per booking, and encourage repeat visitors. Bellebnb is a complete property management system for your Hotel. Sign up for free!. You can use PayPal to process credit card payments directly from your Front Desk manager. PayPal is a free addition, and you can even try it out during your 16-day free trial. Before reading this document to connect with PayPal, you should be familiar with the concepts from the first post in this series. This document covers the connection between the Front Desk manager and PayPal. Before connecting your payment gateway, you should be familiar with the payments workflow used by PayPal, including fees and restrictions. In your Front Desk manager, go to 'Settings > Payment Gateway' in the menu on the left, and click to enable your Payment Gateway. Select ‘PayPal’ from the dropdown menu labeled ‘Processor’. Click the link in the description to log in to your ‘PayPal Application Dashboard’. In your PayPal Application Dashboard, click ‘My Apps & Credentials’ in the menu on the left and scroll down to the section titled ‘REST API apps’. Click ‘Create App’. Enter ‘Bellebnb’ for the app name. Under the application details, select ‘Live’ and then copy and paste your Client ID and Secret from the section titled ‘LIVE API CREDENTIALS’ into your Front Desk manager and click ‘Save’. Under the application details in your PayPal Application Dashboard, make sure that only 'Accept Payments' is selected in the section titled ‘LIVE APP SETTINGS’ further down the page (click 'Save'). As mentioned in the first post in this series, funds are only ever deposited into the hotel’s account, and never extracted or returned. 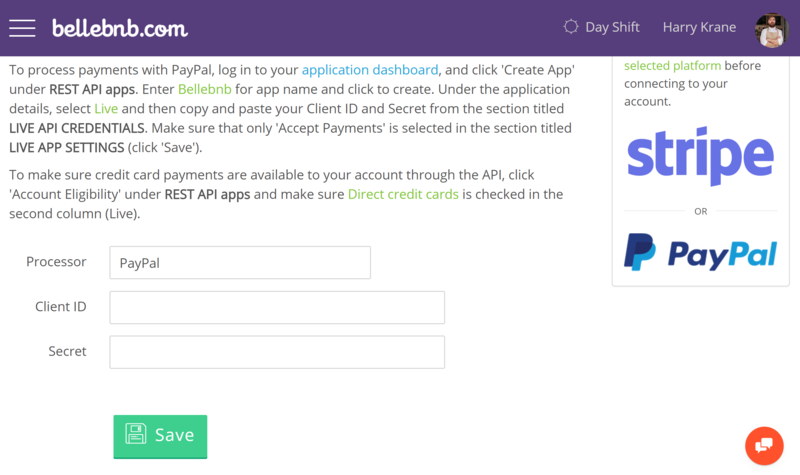 To ensure that your PayPal account is enabled to process payments via the API, click ‘My Account’ in your PayPal Application Dashboard under ‘Dashboard’ in the menu on the left. Make sure ‘Direct Payments’ is checked in the second column (Live). If it is not checked, click ‘Enable’. To test your connection, create a new booking in your Front Desk and process a payment. You should test using one of your own credit cards. You will see the charge to your card, but it's OK because the payment goes to you (minus a small processing fee charged by PayPal). You can try with just $5 or $10, just to be sure. You should see the payment in your PayPal account.